The Vermont Crafts Council presents the first autumn statewide Open Studio Weekend October 1st and 2nd. In Brandon, artists Warren Kimble, Patty Sgrecci, Linda Durkee, and Joan Curtis will welcome visitors into their studios. 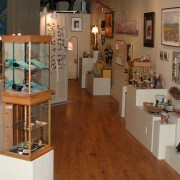 Rebecca Zelis’s shop Adornment Studio & Gallery will be open as well as the Brandon Artists Guild (the BAG) where the work of about 50 artists is on view, displaying paintings, sculpture, and a variety of crafts — fused glass art, ceramics, jewelry, artist-made books, and hand-dyed scarves, for example. The Granary on Union Street, which houses artist studios (e.g., Sgrecci and Durkee), will offer artwork and demonstrations by Guild artist-members Meg Brash, Linda Evans, Wendy Jennejahn, Jill Listzwan, and George Wetmore. BAG artist Stacey Stanhope will be open at Stratford House Pottery in neighhboring Orwell, VT. The VCC maps for the event, which give detailed directions to each venue, are available at the Brandon Artists Guild, 7 Center Street, Brandon, VT. Visitors to the Guild gallery enjoy the extra bonus of seeing the artist-made-and-decorated clocks — a fund-raiser celebrating “Art Makes Brandon Tick.” It’s a good time to check out the clocks again before the Columbus Day weekend, Saturday October 8th auction.